Note: This trail is often closed just beyond the overlook area. Here is a little hike that has tons of beauty for the buck.... in other words, lots of value for little effort. This hike not only gives you outstanding vistas, but allows you to see close up just how devastating the explosion of Mt St Helens really was. The hike begins along Forest Road 99 and begins an immediate gentle climb. In a short distance the trail breaks over the ridge and you are presented with excellent views of Mt St Helens and Spirit Lake. In the first half mile of this hike there are a number of signs and explanation boards to make your hike more interesting and informed. Then the trail becomes more rustic and climbs gently toward Independence Pass. At a mile you will come to the junction of Trail #227A. Continue on, bearing to the left as the trail continues. 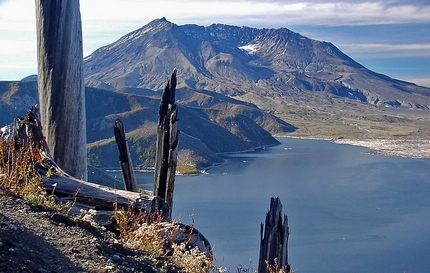 Along this part of the trail, you will be presented with outstanding views of Mt St Helens, Spirit Lake, and even Mt Hood in the far distance. After turning onto Forest Road 99, you will climb westward for about 9 miles before coming to Forest Road 26 on your right, which takes your to the Norway Pass TH and the Goat Mtn TH. 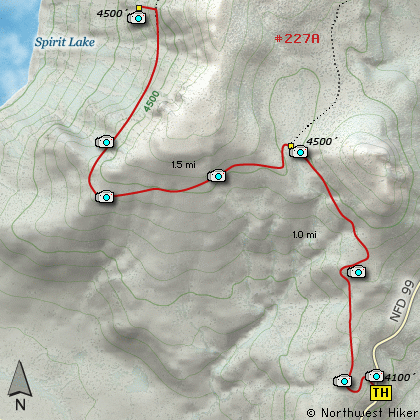 You continue on for a very short distance, and you will pass the trailhead for the Meta Lake hike. Continue along FR99 for about 3 miles and you will pass the trailhead for the Independence Pass hike.